The Vikings will spend Tuesday and Wednesday hosting potential draft targets at their new practice facility in Eagan as part of their top-30 event, where the team consolidates many of its 30 allotted pre-draft visits. The Vikings have long operated this way to see how players interact with one another, in addition to giving coaches time to meet with them individually. They bring players to town for a number of different reasons — to the point where news of a player’s trip to Minnesota shouldn’t necessarily be seen as an indicator the team plans to draft him — but many of the Vikings’ top picks in the Mike Zimmer era have been vetted by a pre-draft visit to the Twin Cities (Laquon Treadwell, Trae Waynes and Anthony Barr among them). 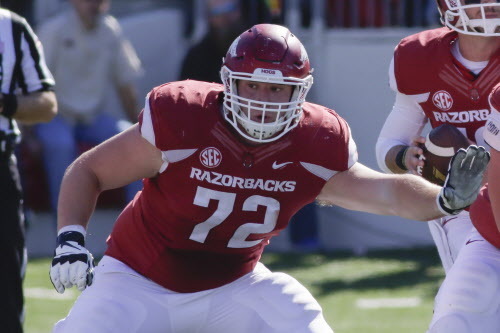 This year’s list of players is expected to include Arkansas center Frank Ragnow, who met with the Vikings at the combine, as well. The Chanhassen product doesn’t technically count as one of the Vikings’ 30 allotted visits, since he grew up in the Twin Cities, but his name certainly is one worth keeping in mind as the Vikings consider ways to continue investing in their offensive line. Maple Grove product Jake Wieneke, who built plenty of buzz for himself at South Dakota State, is also expected to attend.